Very nice. I particularly like the opening and how they curve to the left. 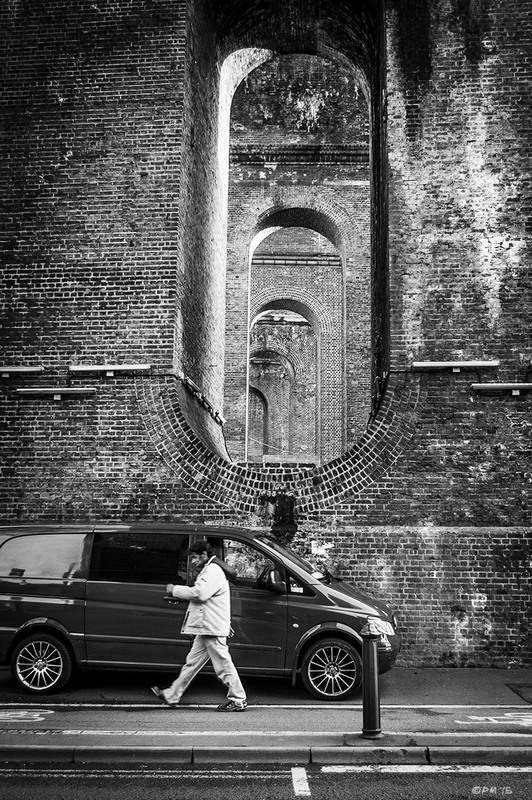 It is quite a feat of engineering, the Victorians did some incredible things with bricks some of which is beyond our ability to achieve today. Gorgeous! That clever architect would probably be delighted to know that decades (centuries?) on someone still appreciated his vision. John Urpeth Rastrick did a fine job designing it and the Viaduct was finished on 28 March 1846 so it’s not really that old, around ten million bricks laid in ten months is pretty impressive work. You might notice that the bricks on the third pier back look cleaner than the others, this one was bombed in WWII and had to be rebuilt. Thanks for the info. I definitely saw a brick theme in your photos this week. Black and white loves brick! And always, such a great eye for the odd detail. Cheers! Thank you for your kind words Melissa, very much appreciated.